After romping to six consecutive Bundesliga titles, even the most diehard Bayern Munich fan would begrudgingly admit that the 28-time German champion’s monopoly on the Bundesliga title was becoming a little boring and potentially damaging the league’s image — particularly overseas — and its potential profitability. 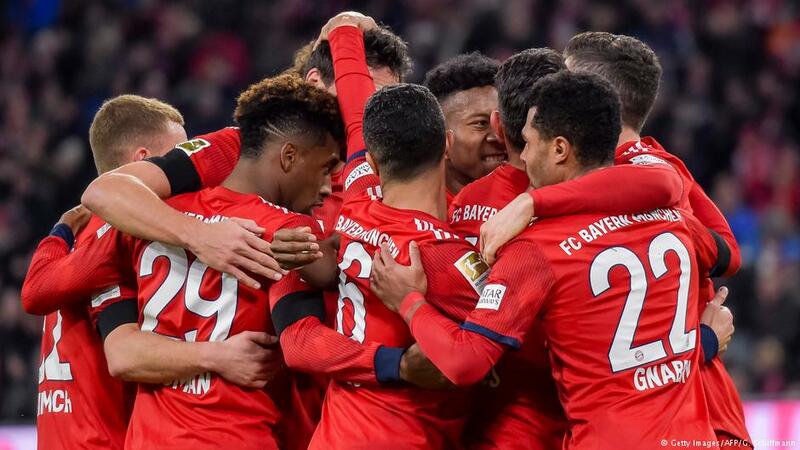 Even the German Football League’s (DFL) CEO Christian Seifert was irked by Bayern’s dominance, regularly urging Bundesliga clubs to increase the level of competition for the serial winners. Therefore, this season’s title race is a timely godsend for “product Bundesliga,” aided immensely by Bayern enduring their worst season in seven years with four Bundesliga defeats already after 21 games. So, Seifert has finally had his wish granted with the combined Borussia might of Dortmund and Mönchengladbach challenging Bayern for Bundesliga supremacy. By failing to improve their squad last summer, Bayern’s overdue, yet inevitable downturn couldn’t have happened at a more opportune time — especially considering that the league’s TV rights are up for grabs next year for the 2021/22 period. DFL is set to begin its tender preparations this year and issue the rights sometime in the spring or summer of 2020. What better way to plug the Bundesliga than on the back of the most exciting title race in recent memory? Bayern’s hierarchy, most notably CEO Karl-Heinz Rummenigge, has always been less than amused by the huge financial advantage enjoyed by the Premier League elite on account of their massive TV bonanza, both domestically and internationally. While Rummenigge has described the Bundesliga’s current €4.64 billion ($5.23 billion) contract as “outstanding,” the Bundesliga still lags massively behind the Premier League, which has set the benchmark for sport broadcasting rights. In the UK, bitter competition between Sky and BT Sport has resulted in a veritable domestic rights explosion in recent years to over 5 billion pounds (€5.7 billion, $6.4 billion). Interestingly, Amazon has broken Sky and BT’s coverage stranglehold by striking a ground-breaking deal to also livestream matches from next season. However, it’s in the international stakes that Bundesliga seriously needs to play catch-up. Worth 3.3 billion pounds, the Premier League’s international rights are more than 13 times that of the Bundesliga’s estimated €280 million from TV sales. By opening offices in Singapore and most recently New York, DFL has shown it wants to redress this huge disbalance and spread the Bundesliga message abroad. Fox, the international rights holder for the United States, is in the final stretch of a five-year deal. News of Christian Pulisic’s transfer from Borussia Dortmund to Chelsea will surely not aid the prospects of a bumper new payday. However, there is genuine hope that new kids on the block like Weston McKennie (Schalke), Tyler Adams (Leipzig), Josh Sargent (Bremen) and even Canadian Alphonso Davies (Bayern) can make an immediate impact and ease the pain of the prodigal son’s departure. Before 2016, Sky enjoyed a domestic pay TV monopoly in Germany, agreeing to pay €3.5 billion over four years, an increase of 80 percent on the €1.9 billion it paid in the previous cycle. Sky, now owned by US media giant Comcast, was joined by Eurosport (part of Discovery) for live match coverage with ZDF also picking up some scraps as well. Going forward, Amazon has already entered the audio rights race in Germany and can be expected to expand its online streaming coverage. Another popular service, DAZN, is already showing Bundesliga highlights and is interested in adding a Eurosport-type package to its burgeoning streaming portfolio. With Sky Germany likely to remain the major player showing the main bulk of action, the DFL will be hoping — bearing in mind the impact of BT Sport’s entry into the UK market — to attract increased competition and rivalry for the major German pay TV provider, to spark a revenue boom. Meanwhile, Rummenigge is supremely confident that TV football rights deals will continue to “rocket” and predicted more major global companies, in particular deep-pocketed technology and streaming giants, would become involved. “US firms like Apple, Amazon, Netflix will all come on board because for these firms it’s not important whether rights cost €500 million or a billion,” he told GQ magazine. “It’s decisive for them whether the rights are exclusive and adds to their dissemination strategy. “The first new players have already arrived — Eurosport, Amazon and DAZN. They are making their first experiences. In the future, they will get more heavily involved and target specific markets. Prices will rocket when everyone is fully on board,” said Rummenigge. Meanwhile, in the coming weeks, the Bundesliga big boys have the chance to flex their muscles on the pitch against the current top-three in England in the last 16 of the Champions League. Bayern take on Liverpool, Dortmund play Spurs while Schalke face Manchester City. A win or two in these three mouthwatering matchups would provide a timely boost to the Bundesliga’s image before the bidding war commences in earnest, both at home and abroad.